Kino Lorber are releasing a second DVD set of Gaumont films. The first, Gaumont Treasures vol. 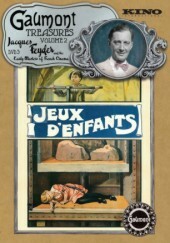 1(1897-1913), featured films made by Alice Guy, Louis Feuillade, and Léonce Perret, and was effectively a cut-down version of a deluxe box set issued by Gaumont in France. 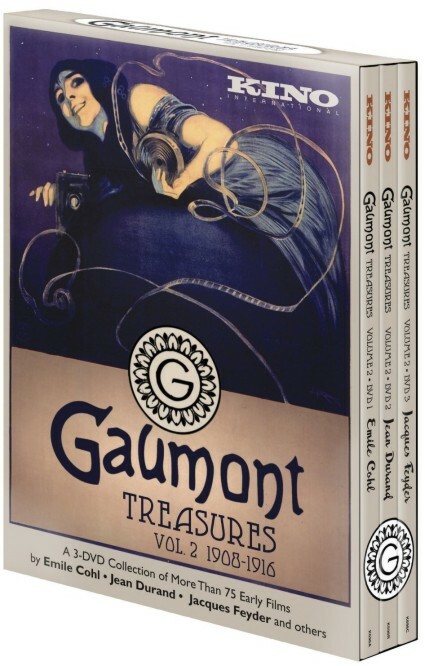 Now Gaumont Treasures vol. 2, 1908-1916 is to be released on 19 April, featuring the work of Emile Cohl, Jean Durand and Jacques Feyder. Again it is based on a more extensive French original release (six discs), but the Kino release alone looks sensational – three discs, just under 600 minutes of film, and containing some of the most creative films of the early cinema period. 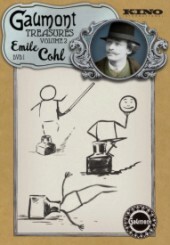 Cohl was the first master of the animated film, Durand produced surrealist comedies and adventure dramas, and Feyder made films of surpassing elegance and wit. There are works from other filmmakers, examples of synchrononised sound films (Phonoscenes) and examples of Chronochrome, Gaumont’s hauntingly beautiful three-colour process. 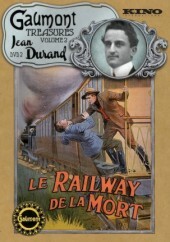 Mini-documentary, written by Pierre Philippe, recounting the career of filmmaker Jean Durand through photographs and film clips. This is a sensational collection. Here is the infant cinema already able to hold its held up as a mature medium, capable of displaying artistry of the highest order. With this and volume one of Gaumont Treasures, plus Flicker Alley’s five disc set of the works of Georges Méliès (plus an ‘encore‘ sixth disc), and the recent Spanish release of a Segundo de Chomón DVD set, we are astonishingly blessed with DVD releases of early French cinema. And there will be more – a four-disc set of the works of Albert Capellani, another director of style and vision, is promised by Pathé in May.